Our grandfathers don’t know how lucky they were. Sure they had to fight in WWII, but there were only 2 kinds of screws back then. Now if I wanna void the warranty on my coffee maker I need torx, hex, philips, flat, it never ends. You have to have a tool kit even if you just wanna tighten a chair leg. You’d be lucky to find a wing nut, and not need 3 different hex keys to get it done. 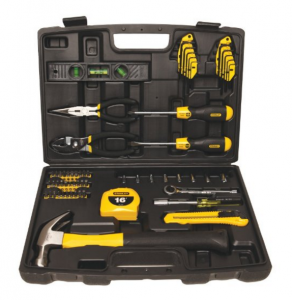 This set covers home fixes and more with the bullet level coming in handy for hanging pictures. If you have to knock on another man’s door for a hammer, use it to smack yourself.